Tropism branches in a variation of art domains with nature, science and technology as frequent ingredients in order to surprise and perhaps every now and then generate awareness. All projects on this site are available for festivals, galleries, museums, theatres or, if applicable, obtainable as works of art. As we have expertise in a rare and qualitative combination of competence, an array from concept, scenario, film, television design, production, documentary, animation, experiences and VR, to initiating and curating exhibitions, Tropism Productions can offer moving media made to measure. With art we can fulfil, cheer and enlightening. ​• REBIRTH OF VENUS - stop-motion animation film short art-house film. A tropism (from Greek τρόπος, tropos, 'a turning') is a biological phenomenon, indicating growth or turning movement of a biological organism, usually a plant, in response to an environmental stimulus” (Wikipedia). The most common example of tropism is a plant growing in the direction of light. 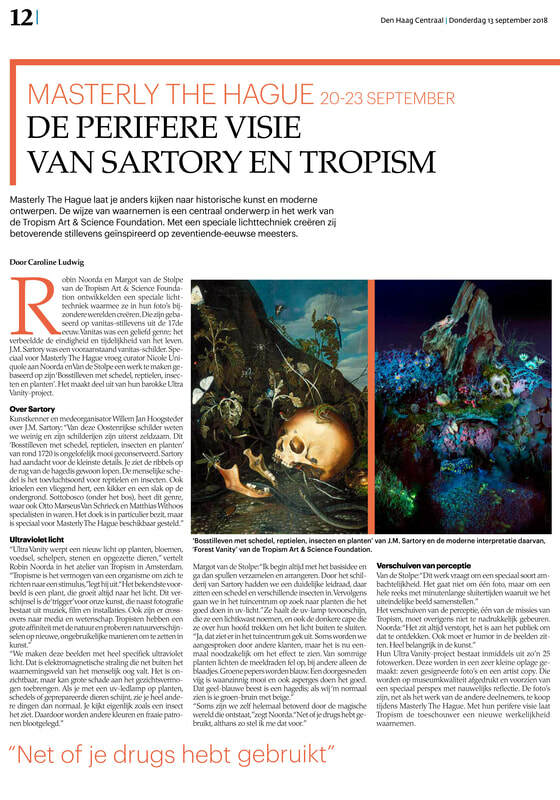 The Tropism was founded some thirty years ago in 1986 by Alfred Marseille, Robin Noorda and Bob van Walderveen †. Current members also include Margot van de Stolpe, Menno Schrap, Paul Godschalk and a range of guest Tropists. Taking their lead from the biological phenomenon, the Tropists are a Dutch collective of installation artists, photographers, media artists, designers, cineasts and scientists. In their work they deal with phenomena occurring literally or figuratively at the edge of perception - events that are hardly noticed, but which lead to a reaction similar to the manner in which a plant responds to light (e.g. phototropism.) The Tropists feel a great affinity with the natural world and their works seek to depict natural phenomena in new and unusual ways. Sustainability and awareness are areas of interest and are involved in most of the Tropistic works although the artists do not emphasize this. It is a message well wrapped to be revealed and experienced as a personal discovery and thus hopefully persist better in the mind of the spectator. A good example of that is our travelling exhibition Photosynthesis, consisting of 122 photographic works, 2 installations and 10 films targeted at shedding new light on plants. After visiting the exhibition the visitor has gained a persisting shifted and lifted perception of admiration for nature.